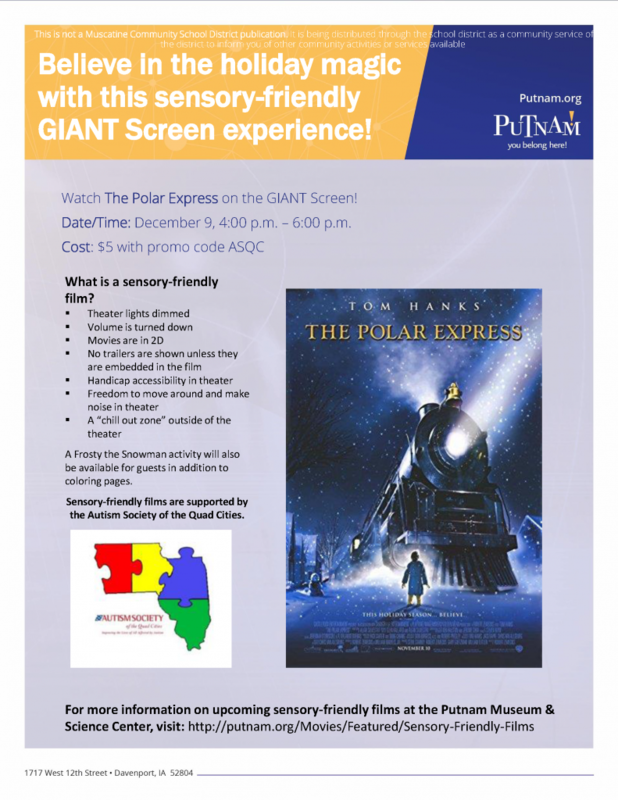 Description: The Putnam Museum is hosting another sensory-friendly film event! “The Polar Express” will premiere in its sensory-friendly version on the Putnam GIANT Screen Theater on Sunday, December 9 at 4:00 p.m. The film will be modified to be “friendlier” to the senses. Changes to the environment and film experience include: theater lights dimmed but not turned off, volume turned down, all movies in 2D and few to no trailers before the film. The GIANT Screen Theater is fully accessible. Patrons can move around and make noise during the show as well as bring in outside food and drink to suit their dietary needs. A designated “chill out zone” is available outside of the theater, providing additional comfort for all guests. A Frosty the Snowman activity will be offered in addition to traditional coloring pages. ALL ticket prices will be $5 per person using promo code ASQC at checkout. We hope to see you there! Please visit putnam.org/Movies/Featured/Sensory-Friendly-Films for more information. Sensory-friendly screenings of documentaries on the GIANT Screen will be offered every second Sunday of the month.